The Saunders-Roe SR.45 Princess was a British flying boat aircraft built by Saunders-Roe, based in Cowes on the Isle of Wight. The Princess was one of the largest aircraft in existence. By the 1950s, large, commercial flying boats were being overshadowed by land-based aircraft. Factors such as runway and airport improvements added to the viability of land-based aircraft, which did not have the weight and drag of the boat hulls on seaplanes nor the issues with seawater corrosion. 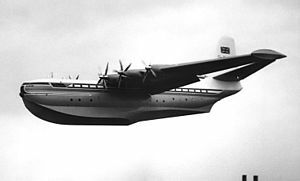 In 1945, Saunders-Roe was asked by the British Ministry of Supply to bid for a long range civil flying boat for British Overseas Airways Corporation (BOAC), who planned to use them on transatlantic passenger services. Saunders-Roe's bid was successful, and it received an order for three aircraft in May 1946. The Princess was powered by ten Bristol Proteus turboprop engines, powering six propellers. The four inner propellers were double, contra-rotating propellers driven by a twin version of the Proteus, the Bristol Coupled Proteus; each engine drove one of the propellers. The two outer propellers were single and powered by single engines. The rounded, bulbous, "double-bubble" pressurized fuselage contained two passenger decks, with room for 105 passengers in great comfort. The ailerons and rudder were split into multiple sections such that if a part of the servo-powered control system failed the faulty section could be "trailed" so that it did not act against the working sections. The planing bottom of the hull had only a slight step in the keel to minimize drag in the air. In 1951 BOAC reevaluated its needs, and determined it had no need for the Princess. It was announced that construction of the three aircraft would continue as transport aircraft for the RAF. However, in March 1952, it was announced that while the first prototype would be completed, the second and third would be suspended to await more powerful engines. The prototype, G-ALUN, first flew on 22 August 1952 and was flown by test pilot Geoffrey Tyson off the Solent. A planned two- to three-hour flight was curtailed because of erroneous readings on airscrew bearing temperature. Three more flights followed in that week and then it appeared at Farnborough that year. G-ALUN was the only one to fly - making 46 test flights in total, about 100 hours flying time. It appeared at the Farnborough Airshow in 1953. Princess Air Transport Co., Ltd was formed with the object of studying the factors affecting the operation of the Princess flying boats and to tender for their operation should the opportunity have arisen. The Directors were M. D. N. Wyatt (chairman), Sir Archibald Hope, Mr. G.A.V. Tyson, Mr. P.D. Irons and Capt. H.W.C. Alger (general manager). Three-quarters of the share capital were held by Saunders-Roe, Ltd., and one quarter by Airwork, Ltd.
Two other Princesses (G-ALUO and G-ALUP) were built, but they never flew. Aquila Airways offered �1 million each for the Princesses in 1954 , but this offer was rejected. The three aircraft were cocooned, one at Cowes and two at Calshot Spit, with the hope that work would be restarted when a buyer was found. A number of offers were made to buy the aircraft, including two which involved re-engining them with Rolls-Royce Tynes, while Saro proposed in 1957 to convert them to landplane troop carriers/freighters. In 1964, they were finally purchased by Eoin Mekie on behalf of Aero Spacelines, who planned to using them as heavy-duty freight aircraft for transporting Saturn V rocket components for NASA. However, when the cocooning was removed, it was found that they were badly corroded (the contract for maintenance and inspection of the stored aircraft had been allowed to lapse, which resulted in the airframes deteriorating rapidly), and all three Princesses were broken up by 1967. They were the last fixed-wing commercial aircraft produced by Saunders-Roe. The company built one more fixed-wing design, the Saunders-Roe SR.53 mixed-power (rocket and turbojet) fighter design; aside from that, the company concentrated on helicopters and hovercraft after this point. While the prototype aircraft had advanced (but conventional) hydraulic controls, S-R intended production aircraft to use an analogue system based around electrical servos with hydraulic final control actuators. Such a system was built and ground-tested, but the Princess project was cancelled before any aircraft was fitted with the system. In 1958 information on the Princess was passed to the United States Navy who were looking at the possibility of converting the three aircraft in storage to use nuclear power. Bridgman, Leonard. Jane's All The World's Aircraft 1952-53. London: Jane's, 1953. "Concerning flying boats". Flight, 6 July 1951. pp. 10-11. "Flying ship on the stocks" Flight, 16 March 1950, pp. 344-345. London, Peter. Saunders and Saro Aircraft since 1917. London: Putnam, 1988. ISBN 0-85177-814-3. "The Princess: Design Details of the Great Saunders-Roe Flying boat." Flight, 26 September 1952, pp. 411-422.